LOCATION.--Lat 42°40'49", long 76°57'14" referenced to North American Datum of 1983, Yates County, NY, Hydrologic Unit 04140201, on right bank at upstream side of bridge on Milo Street in Dresden, and 0.4 mi upstream from mouth. PERIOD OF RECORD.--April 1965 to current year. REVISIONS HISTORY.--WDR NY-86-3: 1984 (M). GAGE.--Water-stage recorder. Datum of gage is 445.35 ft above NGVD of 1929 and 444.85 ft above NAVD of 1988. Prior to Oct. 1, 1982, at datum 2.00 ft higher. Previously published datum prior to Oct. 1, 1982, was incorrectly given as 446.67 ft above NGVD of 1929 (1.32 ft higher); it should have been 447.35 ft. Previously published datum, Oct. 1, 1982 to Sept. 6, 1991, was incorrectly given as 444.67 ft above NGVD of 1929 (0.68 ft lower); it should have been 445.35 ft. REMARKS.--Flow regulated by Village of Penn Yan. 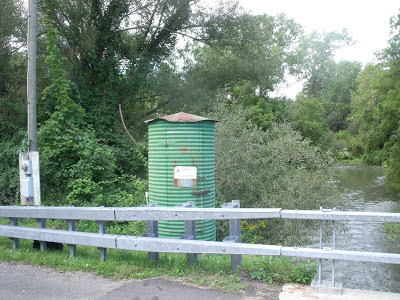 From 1931-98, a large part of flow from 45.5 mi² of Mud Creek drainage area (Susquehanna River basin) had been diverted into Keuka Lake (Oswego River basin) for power generation. Water Years 2014-16: Records good except those for estimated daily discharges, which are fair. Water Years 2017-18: Records good except those for estimated daily discharges, which are poor. EXTREMES FOR PERIOD OF RECORD.--Maximum discharge, 4,000 ft³/s, June 22, 1972, gage height 8.37 ft, datum then in use, from rating curve extended above 3,000 ft³/s; maximum gage height, 9.67 ft, May 14, 2014; minimum discharge, 3.2 ft³/s, part or all of each day, Sept. 6-10, 1982.